The market can, perhaps, be considered as fully-fledged now, with major international developers actively pursuing utility-scale sites and bidding competitively to do so. The successful bidders in the 32-round Massachusetts marathon auction include Iberdrola's US subsidiary Avangrid Renewables in partnership with Copenhagen Infrastructure Partners; a joint venture featuring Anglo-Dutch oil major Shell and EDP Renovaveis; and Norwegian fossil-fuel giant Equinor. With the addition of leading offshore wind developer Ørsted — incorporating Block Island developer Deepwater Wind — all of the industry heavyweights weighed into the competition. This is a far cry from the previous Massachusetts auction four years ago. Then, the winners were the US arm of RES — which has extensive European offshore experience but owns less than 200MW now, and OffshoreMW, part of German project operator WindMW, which owns one project in its home country, the 288MW Meerwind Süd/Ost site. Half of the Massachusetts zone in 2015 was left unleased, attracting zero bids at the time. The area — originally planned to include two zones — was carved up in to three, meaning less space for the competing developers. As a result, but with the potential in the US now apparent, the latest auction saw prices explode from an average of $309/km2 to $257,925/km2. Offshore wind in the US is no longer a pipe dream. Having the major players involved is a further sign of the health of the country's offshore wind potential. Following its auction success, Shell then launched a second joint venture, this time with EDF Renewables, acquiring a lease area off New Jersey originally awarded to US Wind — a subsidiary of Italian developer Renexia — in November 2015. 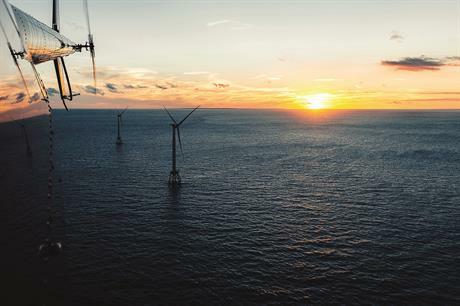 The site is located 12km off the New Jersey coastline and could host up to 2.5GW of offshore wind capacity, the JV partners claimed. Writing for Windpower Monthly online, Liz Burdock, CEO of lobby group Business Network for Offshore Wind, called the involvement of Shell in the US offshore wind sector a potential game changer. US oil & gas (O&G) industry expertise to innovate and continue to drive down costs," Burdock wrote. "Shell's technical skill and knowledge working in the US outer continental shelf provides depth, expertise and insights to construct, operate and decommission an offshore wind project within federal waters. "Its advantage lies in its strong relationships and partnership with the O&G supply chain, expertise with the US regulatory system and stakeholder engagement strategies. "In short, Shell's entrance has moved offshore wind directly into the mainstream of the US energy industry," Burdock added. As well as major developers, the supply chain is also moving in. In January, turbine manufacturer MHI Vestas opened its US headquarters in Boston, Massachusetts. MHI Vestas appointed Jason Folsom, the former head of offshore wind sales in the Americas for Siemens Gamesa Renewable Energy, to lead its US division in October. It has not been all plain sailing, however. In December the New Jersey Board of Public Utilities (BPU) rejected the 25MW Nautilus pilot project off Atlantic City on the grounds that developer EDF Renewables could not demonstrate the necessary local benefits. The BPU did however approve a funding mechanism to meet the state's goal of having 3.5GW offshore wind. The US is not messing around with small-scale pilot projects. It is diving straight in to gigawatt-scale projects. New York governor Andrew Cuomo has said his state is targeting 9GW of offshore wind capacity by 2035 — meaning at least 600MW needs to be added on average every year in just that one state. A 2016 Department of Energy (DoE) report into offshore wind in the US put its gross resource potential at 10.8TW and a technical resource potential at 2TW. While this figure is not realistically achievable, the DoE stated that if just 1% of the technical resource potential could be harnessed, offshore wind could power 6.5 million homes in the US. "Developing just 86GW, or about 4% of the US offshore-wind technical resource potential, by 2050 would support 160,000 jobs, reduce power-sector water consumption by 5%, and cut America's greenhouse gas emissions by 1.8%," the report said. It seems US lawmakers, at least at a state level, have recognised this potential and are now clearing the way. There are still hurdles, however, which may break the momentum. "Beyond this recent activity and excitement remains the need for an extended project pipeline to avoid cyclical development periods," Burdock wrote in her comment. "Offshore wind developers have expressed concern that the Bureau of Ocean Energy Management does not have any new wind-energy area lease auctions scheduled for 2019 — the next one is set for early 2020 in the New York Bight. "Industry and some Congressional leaders have suggested the bureau conduct regularly scheduled auctions, for instance at least four annually, to provide a predictable schedule of sales for developers and investors," Burdock continued. "This would accelerate the development of new offshore wind projects, and provide greater predictability in the marketplace, which in turn would reduce the cost of capital and, ultimately, reduce the cost of the electricity sold to the grid. "A robust and predictable leasing schedule, the support of regional and local stakeholders and the commitment from Congress to provide the necessary resources, will unleash private-sector investment and entrepreneurship to truly make US offshore wind a global leader," Burdock suggested.